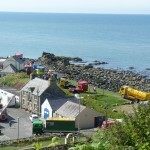 On Saturday 11 July, a convoy of vintage lorries, tractors, vans, maybe a fire engine or two, an anbulance – who knows, will arrive in Portpatrick. By Saturday evening, every available space on and around the sea front and harbour will be filled with an interesting vehicle. It is quite a spectacle and very popular with visitors to Porptatrick who love to walk around these well maintained and often very colourful vehicles. If the weather is good, the tables outside the harbourside bars are usually very busy. We have a room vacant at Rickwood over this weekend so, if you`d like to stay over please let us know.